(Malmoe, Sweden – September 2016) Seavus, globally authorized master distributor for the software PrimaveraReader today announced a reseller partnership with CMCS. The partnership focuses on expanding PrimaveraReader’s client base in several countries CMCS operates in, combining CMCS’s exceptional expertise and Platinum Oracle Partner status with PrimaveraReader’s innovative product offerings. PrimaveraReader is a cost effective viewer for Oracle Primavera P6 files exported as .xer or .xls file types. PrimaveraReader improves transparency between and among project teams by allowing everyone involved to open, analyze and print Oracle Primavera P6 schedules in a dynamic way without the need to purchase costly licenses for all project participants. The recently released version – PrimaveraReader 2.1, provides several new benefits for project-oriented companies, with the main focus being on improving the resource assignment decisions and optimizing budgets spent during any given stage of the project. “We are very pleased to begin our cooperation with a reseller with such an impressive knowledge working with Oracle Primavera P6, significant awards base and notable client portfolio. We are convinced that with mutual efforts the value we deliver to our current and potential clients will multiply.” – Zoran Trajkovski, Senior Business Consultant working on PrimaveraReader. Since 1984, CMCS has received 50 awards for their performance including the first and only Primavera Four Million Dollar Club award. CMCS, a Platinum Oracle Partner, is a specialized Oracle Primavera EPPM P6 8.2 and PCM 14 partner. CMCS has also achieved Oracle Specialization in Engineering & Construction, Oil & Gas Industries and Public Sector. Over the past 30+ years, the CMCS team has served 4,000+ clients in 40+ countries in the Middle East, Asia, Europe, Africa and the Americas attaining 55+ performance achievement awards. Just in the past 10 years, CMCS has completed 3,750+ project assignments and shared our project management knowledge with 15,000+ professionals by delivering 36,000+ hours of classroom training. To read more information regarding PriamveraReader, please visit: www.primaverareader.com. CMCS is the leading Project Management Consulting organization in the Middle East combining deep industry knowledge, unmatched track record in delivering Oracle Primavera and PMWeb solutions, internationally accredited project management training and disciplined project and risk management practices. CMCS provides integrated, 360°, sustainable, quality Project Portfolio Management (PPM) solutions helping capital-intensive organizations in the Engineering and Construction, Infrastructure, Oil and Gas, Power and Energy and Public Sectors to identify, prioritize, select and deliver all projects right, the first time. Seavus® is a software development and consulting company with a proven track-record in providing successful enterprise-wide business solutions. The company has over 650+ IT experts worldwide and offers a variety of products and service options, successfully covering the European and US market from several offices in the world. Their expanding portfolio covers: BSS/OSS, CRM, CEM, Business Intelligence solutions, ALM, embedded programming, business and consumer products, mobile and gaming solutions, managed services, as well as custom development, consultancy and resourcing. The Seavus portfolio includes over 3,500 customers, including leading worldwide telecoms and handset manufacturers, organizations from the banking and finance industry, consumer electronics, technology, education, government, and health, to name but a few. Seavus is a globally authorized master distributor for the software product family PrimaveraReader. DUBAI (September 13, 2016) – Collaboration, Management and Control Solutions (“CMCS”), a leading project management consulting organisation, today announced an agreement with Altus Group Limited (“Altus Group”) (TSX: AIF), a leading provider of independent advisory services, software and data solutions to the global commercial real estate (“CRE”) industry. This agreement allows for joint business development and sales of Altus Group’s ARGUS Developer product in the MENA region and India. For over 30 years, CMCS has empowered organisations around the world with innovative solutions to help them make the best informed decisions possible when selecting, delivering, governing and auditing multi-billion-dollar construction programs. This expertise, combined with Altus Group’s decades of experience providing industry leading technology for real estate investment, asset management and development lifecycle management, presents a unique offering to the MENA and Indian CRE and construction markets. ARGUS Developer is a comprehensive single platform to model, forecast, manage, analyse and report on CRE development project cost and cash flows, from project inception and feasibility through to planning, execution and completion. CMCS will be running a series of training days in Dubai in December, tailored specifically for the development sector. These sessions will focus on feasibility analysis and development monitoring, and are designed for anyone looking to expand their knowledge and skills in these areas. For more details about these training days, please contact CMCS at info@CMCS-MENA.com. CMCS is the leading Project Management Consulting organisation in the Middle East combining deep industry knowledge, unmatched track record in delivering Oracle Primavera and PMWeb solutions, internationally accredited project management training and disciplined project and risk management practices. CMCS provides integrated, 360°, sustainable, quality Project Portfolio Management (PPM) solutions helping capital-intensive organisations in the Engineering and Construction, Infrastructure, Oil and Gas, Power and Energy and Public Sectors to identify, prioritise, select and deliver all projects right, the first time. This article will be the first of many new articles that will be published by CMCS to bring awareness on the best practices in sustainable project management and how it can it help in achieving the UNDP 17 sustainable development goals (SDG). This article will be the first of many new articles that will be published by CMCS to bring awareness on the best practices in project management in particular as it relate to the latest trends in project management information systems, Big Data Analytics, Sustainability in Project Management among many others. AARHUS, Denmark – July 2016 – TimeXtender, the world’s leading provider of data warehouse automation (DWA) software for Microsoft® SQL Server®, today announced a reseller partnership with CMCS. CMCS is also a leading Qlik reseller and solution partner. This agreement allows CMCS to offer the combined data warehouse and business intelligence package to their clients within Middle East, North Africa and India. With more than 2,600 customers across more than 60 countries, TimeXtender became a Qlik Technology Partner in May 2016. The agreement provides the marketplace with an integrated solution of Data Warehouse Automation by TimeXtender and visual analytics and business intelligence from Qlik. “CMCS provides their customers with the power to create better analytics. By partnering with TimeXtender, CMCS can expand on the strengths and capabilities of Qlik to get more robust solutions up and running even faster,” said Heine Krog Iversen, CEO, TimeXtender. The partnership provides current and future CMCS customers an avenue to democratize access to corporate data, enabling business users and liberating IT. TimeXtender’s TX DWA, coupled with either Qlik Sense or QlikView, puts user-friendly data in the hands of the right people at the right time. It protects the data in a secured and governed fashion while displaying the data in a stunning, analytical visual presentation, helping organizations reduce the gap between business and IT, and to realize the numerous benefits of a modern data infrastructure. This integration package also allows business users to independently and easily make changes and upgrades through drag-and-drop functions and without IT support. “At CMCS, we know that Qlik and TimeXtender together offer unprecedented governance and efficiency of data access for decision making, improving total cost of ownership and accelerating time to value,” said Bassam,Samman, CMCS, CEO. For sales or partnership information regarding this announcement, contact Ayla Marina Lundorff, TimeXtender partnership manager, at aml@timextender.com. TimeXtender has headquarters in Denmark and the U.S. The company has more than 2,600 customers across six continents using its data warehouse automation (DWA) platform, making it the world’s leading DWA solution provider for the Microsoft® SQL Server®. The company democratizes access to corporate data, enabling business users and liberating IT. It sells its products direct and through its global network of channel partners and is a Qlik Technology Partner. TimeXtender helps companies, from any vertical industry, rapidly deploy and automate their data warehouse solutions on a Microsoft SQL Server. It is fully compatible with Visual Studio and all associated Microsoft SQL Server tools and has a strategic role in helping customers save deployment and maintenance time and costs, while offering end-users a more robust and easier-to-use data warehouse and business intelligence system. The Deloitte GCC Powers of Construction 2016 report has also many other important articles that relate to the challenges facing the engineering and construction industry in the MENA region today. Rail infrastructure: Is it time for GCC countries to consider ramping up PPPs as an alternate delivery model? 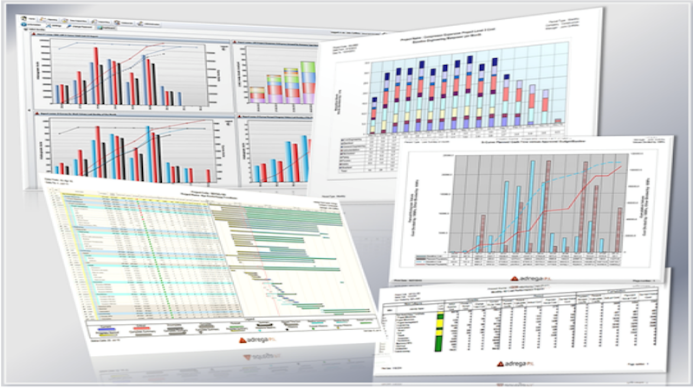 Adrega PI (Project Intelligence) gives you high quality project portfolio dashboard and spreadsheet reporting for Primavera P6. all at the click of a mouse. These are examples of issues that contribute to making reporting of project performance and S-Curves along with various other report types in Primavera P6 a complicated and time-consuming process. As a result, project schedulers often resort to using two reporting tools, one to create S-Curves and performance reports and another to produce better quality Gantt charts. Adrega PI replaces all ad-hoc reporting tools with a single, centralized, role-based reporting solution. What Does Adrega PI Mean to Your Organization? Build up a history of the project’s period-by-period progress in the Adrega PI database. The benefit is that it is a centralized reporting solution available on a company wide basis through a web browser. For users to get the maximum benefit out of using Adrega PI reporting of historical performance or status data, the feature “Save Period Performance” in P6 can be used to save periodic project status, or Adrega PI will create the history based upon the Data Date with each new import of P6 data via the .XML file. 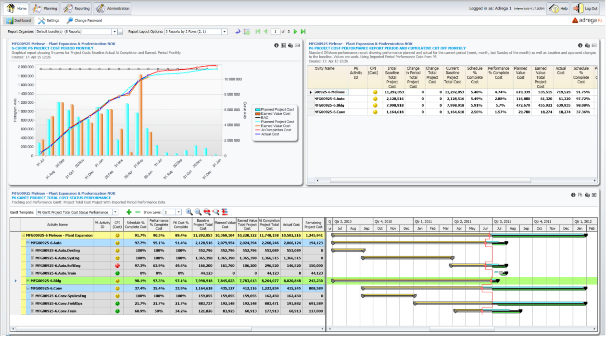 Adrega PI’s historical time phased capability augments your Primavera P6 investment with respect to earned value reporting. With time phase data, S-Curves and current period/cumulative reports at your fingertips, earned value reporting and trend analysis becomes much more feasible with Primavera P6. The “Compare View” in Adrega PI displays data for the project before it is updated (current) as well as what the project will look like once the changes for the new period have been merged. The left pane of the “Compare View” displays status for the previous period while the right pane displays current status. This represents how the project will look when current status is merged with the previous period. Report Bundles is another feature that simplifies and speeds up the process of running the same reports against specific projects at each reporting period, without the need for project and report template selection at the time when the reports are run. With a single click, you can run a complete set of preconfigured Graphical and Tabular reports for a single project or a program of projects. Everything is pre-configured; no changes to column widths, modifications to headers and footers are required. Report bundles support an unlimited number of projects and associated reports. Finally, you can select PDF as the output format, which allows you to produce a PDF file with only one click. Users can go directly to their personal Dashboard and view a pre-defined report set called a “Dashboard Report Bundle”. There is no need to save status or save the project, as access to the latest project information is automatic. Alternatively, you can open the Reporting Module and, with a few mouse clicks, run all preconfigured reports using predefined report bundles. Adrega PI is an affordable system that adds significant reporting capabilities to a Primavera P6 solution; and does so in a very elegant way. Many organizations could save a lot of time, money and frustration by using Adrega PI with P6 and will certainly enjoy the additional features that simply are not available in Primavera P6. Reston, VA – Clarabridge, Inc., the leading provider of intelligent Customer Experience Management (CEM) solutions for the world’s top brands, today announced that it has further expanded its business globally into Turkey and United Arab Emirates with partners OBASE and CMCS. OBASE is a software and consultancy company located in Istanbul, Turkey with expertise in Business Intelligence, Retail Solutions, and Analytical Solutions. As a new partner, OBASE will offer the Clarabridge solution to its customers and deliver strategic advisory services along with implementation and deployment of the Clarabridge CX Suite. OBASE will be critical in helping to introduce CEM in the Middle East. CMCS, headquarted in Dubai, UAE, provides sustainable integrated 360-degree project portfolio management (PPM) solutions for project-based organizations. CMCS has over 30 years of experience in serving clients in over 40 countries in the Middle East, Asia, Europe, Africa and the Americas. By partnering with Clarabridge, CMCS will lead the way in expanding Customer Experience Management principles throughout the world. “The CEM marketplace in the Middle East is growing quickly. These partnerships will enable Clarabridge to bring superior customer experience tools and technology to businesses in these regions and to locally support their efforts with dedicated consulting, strategy, and ongoing analytics,” said Sal Uslugil, Clarabridge Chief Revenue Officer. Clarabridge’s customer experience management platform helps hundreds of the world’s leading brands put feedback to work. Powered by the industry’s most sophisticated customer analytics engine, Clarabridge collects and transforms all forms of customer feedback into intelligence, allowing businesses to activate the voice of the customer across the enterprise. Industry leaders including PetSmart, United Airlines, Virgin Active, Orbitz, and ADP use Clarabridge insights to inform key business decisions. The result: happy, loyal customers. For more information, visit www.clarabridge.com. CMCS and Case In Point Learning would like to announce their joint agreement of cooperation on the new Simulation Based Learning Courses. Simulation Based Learning uses cutting edge computer programs -provided by TOPSIM Germany and Fissure USA- which help enhance business skills fifteen time faster than regular training. It helps develop practical skills and provides real life experience. Case In Point Specializes in Simulation Based Learning. Our clients come to us for Effective and Engaging Positive Learning Environments, where they Learn Business by Doing Business. CMCS has been providing their services for years to help clients create better and faster decisions in projects. They provide knowledge, tools and techniques to help enhance project performance. TOPSIM have been offering Simulation Solutions for all learning needs for over 30 years now. TOPSIM Simulations are deployed in many companies across the US, Europe and Asia. TOPSIM simulations take learners through the pace of business, strategizing and decision-making thereby enabling their transformation into better leaders and managers. Fissure has been providing their services to Fortune 500 companies for more than 20 years and continues to be recognized internationally as a leader in providing the highest quality computer simulation training. Their client list includes Microsoft, Best Buy Company, Target, Georgia Pacific, PMI and many others. CMCS is pleased to announce the successful delivery of their ‘Project Definition Rating Index (PDRI) Roadmap to Success’ workshop for Borouge’s Ruwais plant in the UAE. Borouge is a leading provider of innovative, value creating plastics solutions. CMCS worked in cooperation with their partner, Valency, to deliver the workshop. PDRI is a collaborative process proven to help project team measure scope definition as projects progress through front end planning, in order to identify risks and take action. It is the world’s most widely used open standard for assessing the quality of scope definition during front end planning for capital projects. For 30+ years, CMCS has empowered clients with the insight to create better and faster decisions in selecting, delivering, governing and auditing projects, programs and portfolios. We have provided our clients with the knowledge, tools, techniques and resources to capture, view and understand projects’ big data with regard to schedule, cost, quality, risk, contracts and communications. We have enabled our clients to transform their data into valuable sources of information to visualize, analyze and share a single version of the truth on a project’s status, health and performance. CMCS has enabled 2,500+ clients in 40+ countries from Real Estate, Engineering & Construction, Infrastructure, Public Sector, Oil & Gas, Power & Utility, Information and Telecommunication among other industries to make better and faster decisions on their projects. In the last 10 years, we have executed 3,750+ projects and shared our project management knowledge with 15,000+ professionals by delivering 36,000+ hours of classroom training. Valency is a Registered Education Provider with the Construction Industry Institute (CII). Valency specializes in the implementation of CII best practices that dramatically improve performance in capital projects.